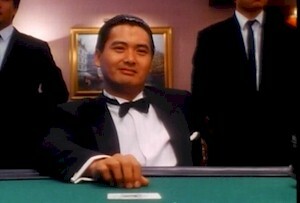 The Skinny: Classic Hong Kong gambling flick with Chow Yun-Fat in one his signature roles. Despite Wong Jing's usual cheesy touches, this multi-genre exercise is good fun for everyone. The ultra classic flick of the late eighties that launched a long-running series. Chow Yun-Fat stars in one of his most famous roles as legendary professional gambler Ko Chun, who’s dubbed the “God of Gamblers” because of his insane ability to beat the odds at the gambling arts. This includes counting cards, hearing dice, psychological intimidation and outright chicanery. All bets are off, as long as Ko Chun comes up roses. Unfortunately Ko Chun gets brain damage when he falls into a juvenile trap set up by two-bit gambler Knife (Andy Lau), who was trying to set up an Indian guy he can’t stand. Ko Chun ends up reverting to a child-like state where he can only be pacified by chocolate. No kidding. Then he helps out Knife and his girl (Joey Wong) by earning him a bundle. However, Ko Chun’s enemies want to do him in and will stop at nothing to gain their revenge, even if it means offing someone who’s obviously not all there.